An ultra-light plane has crashed into a Ferris wheel in a village north of Sydney, trapping four people, Australian officials say. The Cheetah S200 plane with two men aboard did not topple the wheel after hitting it during a festival in the village of Old Bar. 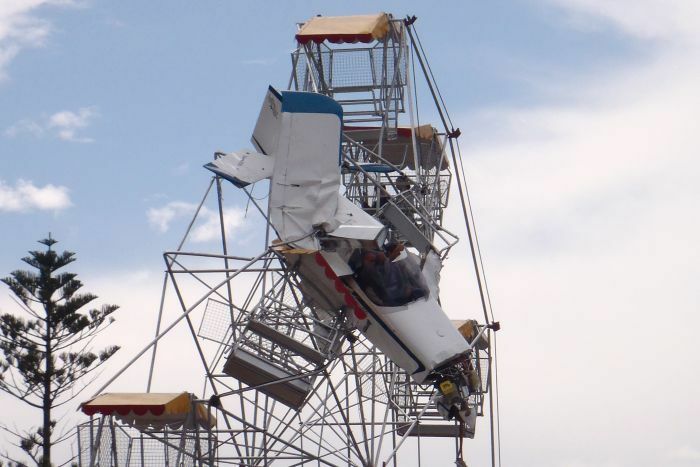 However, it trapped the two men in the plane and the two kids in the ferris wheel before being rescued by a crane. The initial investigations concluded the aircraft reportedly failed to gain enough altitude after taking off from a nearby airport. “Thankfully, everyone was taken down and were able to walk away from it,” New South Wales Rural Fire Service spokesman Ben Shepherd said after the incident in Old Bar, some 220 miles (350km) north of Sydney. According to Police, 2 kids were trapped in the wheel for almost 90 minutes before being rescued. The two men however, spent 3 hours in the crashes airplane. One of the men in the plane, who local media named as John, said he and the pilot had urged the rescuers to free the children first. “Don’t worry about us. Just get the damn kids out,” he said. There were no serious injuries in Saturday’s incident, the officials say. Aung San Suu Kyi released! Previous: Google+ Enters Top 10 Most Popular Social Networking Sites! Next: James Marsden’s Wife Files for Divorce!